Dim sum...the phrase itself means to 'touch the heart'. In Cantonese, the meal is more commonly referred to as 'yam cha', or to drink tea. To yam cha, or go eat dim sum, is to experience a myriad of small dishes pushed around on little carts in a busy, and loud, Chinese restaurant. Historically, the origins of dim sum take us back to the travellers and farmers on the Silk Road. Needing a place to rest, the weary travellers and exhausted farmers would go to teahouses to relax over some tea. It was soon discovered that drinking tea aided in digestion, so teahouse owners began serving small snacks. Dim sum was born. With the establishment of Chinatown in LA in the late 1800's, dim sum's arrival was a natural progression. Today, dim sum is offered in Chinese restaurants all over LA. While you can get decent dim sum in West LA or Santa Monica, the best bet for an authentic experience is in Chinatown or Monterey Park. 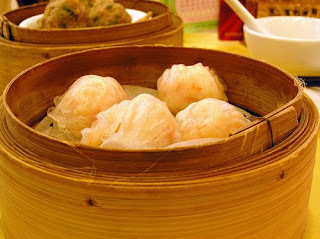 Empress Pavilion and Ocean Seafood in Chinatown offer up amazing dishes of har gow, shu mai and dumplings, to name a few. Empress Harbor and Elite are just two of the many places to go in Monterey Park. Diners will be pleasantly surprised at the variety of dishes offered. Ladies pushing carts will stop at every table to offer their goods. Just pointing your finger or giving a slight shake of head is all that is needed to order or pass on a cart. If you've never tried, please do. Our FoodDigger staff believes it's truly an experience that can touch the heart.